Open 1,800 sf. 2 1/2 Story floor plan with 3 Bedrooms & 2 Full Baths, Wireless Wi-Fi & Netflix on each TV, with Upstairs Sleeping Accommodations with 7 Beds for 9-10 People, consisting of 3 Twin Beds in the 3rd floor Loft Bedroom, 1 Double Bed & 1 Twin Trundle/Day Bed (2 Twin Mattresses) in the 2nd floor Hall Bedroom, & 1 Cal. King sized 'Pillow Top' Bed in the 2nd floor Master Bedroom; Plenty of Off Street Parking-No permit required. 330 sf. Ocean View Deck w/Stainless Steel Propane BBQ Grill, Umbrella Table w/chairs & 2 Chaise Lounges. Inside Laundry Room. Outdoor Hot & Cold Water Shower. Motion Sensored Exterior Security Lighting & Garage Lighting. Wireless WiFi & Netflix. Basic Cable TV, 4 HD TV's, & 4 blue ray DVD disc Players. Self Hosted Luxurious Lodging only 4 Doors to the Coast & another 2 doors to the Sea bright Beach Access Steps; Or you can also walk directly onto the sand at Castle Beach, a block away. This Santa Cruz Beach Rental is located within a short walking distance to most of the Best Tourist Treasures Santa Cruz has to Offer! Charming Cape Cod located on the Coveted 'Avenues', the quiet side of Santa Cruz, on the wide & warm 'Banana Belt' caressed between the Yacht Harbor & the Historic Santa Cruz Beach Boardwalk & Wharf. Elegantly Decorated in a Romantic Cottage Style with Vintage Depression Glass & Antiques. Comfortably Furnished in Elegant Beach Chic w/Reclining Leather Living Room Furniture, Waverly, Ralph Lauren, & Rachel Ashley Designer Fabric Accents/Window Treatments/Bedding, Baby Gate for the stairs, Magnified Lighted Make-up Mirror, Iron & Ironing Board, Formal Dining Table seating for 10, White Resin Wicker Umbrella Table & 330 sf. Ocean View Deck with Alfresco Seating for 7, Beach Umbrella & 3 Chairs for the sand, & a Delightfully Equipped Kitchen! This Santa Cruz Beach Rental is just steps to Seabright Beach, which was Voted the 'Best Beach in Santa Cruz' by Good Times Magazine, with it's Volleyball Nets, Fire Ring Pits, & Picturesque Views of 2 Landmark Lighthouses, the Boardwalk, Wharf, and the Yacht Harbor Entrance. Short drive to Fabulous Antiquing & Shopping Areas, Or WALK to World Class Surfing, Swimming, Sailing, Fishing, Beach Lounging, & seasonally...Harbor Seals, Sea Otters, Sea Lions, Dolphin & Whale Watching...which can occasionally even be seen from the Ocean View Deck! WALK to the many fabulous Restaurants including the famous Stagnaro's, Gilda's, & the Dolphin on the Wharf; The Crow's Nest, Johnny's Harbor side, Cafe La Paloma, & Aldo's on the Yacht Harbor; The Sea bright area's Alfresco Cafe - The Brewery, & the Locals' favorite of the Sea Breeze Cafe. 15 Minute WALK to the FREE Friday Night Summer Concerts, with Delightful Fun for the Kids on the Beach Boardwalk Amusement Park, where the historic “Big Dipper” Roller Coaster is located. 2 Minute Walk to the Marina Loading Dock, near Aldo's Restaurant, for a FREE Seasonal (Memorial Day-Labor Day) Weekend Water Taxi across the Harbor to Twin Lakes Beach & Harbor Fun! We provide a City Map & Santa Cruz Traveler's Guide to each Guest, for your use and to take home with you. Within a 45 minute car ride to the Monterey Aquarium and Cannery Row Shops & Restaurants. Fabulous Location-Walk Everywhere! Quick 15 minute walk to the Santa Cruz Boardwalk & Wharf, only 2 Minute walk to the Harbor & Restaurants. Seabright Beach is just steps from the House, where you can play volleyball or picnic on the Beach-only 4 Doors to the sand! Sea Breeze Cafe, a local's favorite, is a short 1 1/2 block walk on Seabright Avenue, & serves the most delicious Potato Pancakes on Friday mornings - Try it you'll like it! Take short Walks to the Seabright Beach Lighthouse, Santa Cruz Harbor, Wharf, or the Historic Boardwalk Amusement Park. Walk or Bike ride around the picturesque Harbor trail or the West Cliff Promenade, or shop the beach shops on the Wharf. Take the Trolley from the Boardwalk to shop the charming downtown area. 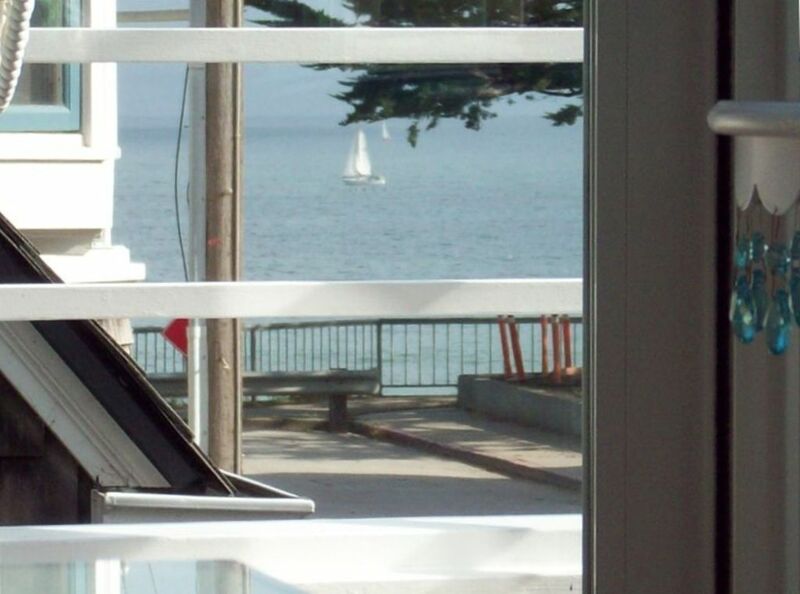 Walk to the end of the Wharf to see the Sea Lions, or view Dolphins seasonally from the Sea Angel's 330 sf. Ocean View Deck. Go antiquing to the fabulous shops up Soquel Avenue starting before 41st Ave in Capitola & finishing in Aptos, or go Wine Tasting at the many local wineries. 2 full baths with spacious 2 person Stall Shower in Hall bath, and Tub under Shower in Master bath. 1/2 hour walk to Downtown Restaurants, Theaters, & Shops. Less than 1/2 block to the Beach! Walk Everywhere! 2 minute walk to the Harbor, 15 minute walk to the Boardwalk Amusement Park, & 20 minute walk to the Wharf with fabulous Restaurants! Partial Ocean Views & Only 4 Doors to the Seabright Beach access steps from this Darling Beach Cottage! Walk directly onto the sand a block away if you have trouble getting down concrete steps. Monterey Bay/Ocean Views from Patio, Loft Bedroom, Living, & Dining Rooms. Plenty of On Street Parking is available surrounding the neighborhood. No Permit Required! Sugar, Flour, Spices, Ground Coffee, Tea, Condiments, etc. Bicycle Rental within 20 minute walking distance near the Wharf. The Sea Angel is elegantly appointed yet very comfortable for families to enjoy. Rear Outdoor Hot & Cold Water Shower to Rinse the Sand off of those 'Bathing Beauties'...also known as Children. We stayed at the Sea Angel from March 23rd to 26th. When we arrived, the house was absolutely stunning as we had walked in, and the view from the house is beautiful. When my daughters and their friends had walked in, their expressions were more than amazed, like a little kid going to Disneyland for the first time. You are able to see the waves crash from the balcony, and feel the amazingly salty air. The house is decorated beautifully, and it was very clean. We had visited the beach often, and it was a delight to come back to the Sea Angel to wind down and relax for the day and night. It was spacious and the decor set everything in the right mood for our beach paradise stay. The boardwalk was a small yet beautiful walk away. We loved our stay at the Sea Angel, and we recommend it to anyone looking for a great seaside stay. wonderful house & location.I just wish had 3 master bedrooms. We had a great time .The house was clean & had everything we needed during our stay there. My two daughters, three grandsons (aged 10-13), and I spent 4 nights at Sea Angel in July. The location was fantastic for us - just half a block to the beach and a 15 minute walk to the boardwalk. We were able to keep the boys active and off their electronics the whole time. We had 2 cars and parking in front was never a problem (although we were not there on the weekend). As advertised, the house is stocked with depression glass dishware and glasses. Having 3 active boys, I put all of the depression glass out of reach and we mostly used paper plates and cups. The boys slept in the upper loft area and had no problems with the spiral staircase at their age. Highly recommend the house for anyone who enjoys easy access to the beach and boardwalk. We had an amazing time at the Sea Angel! We had an amazing time at the Sea Angel rental property. The worst part about our trip was going home. The beach is steps away and the weather was perfect. We also enjoyed a short walk to the museum as well as walking to the Boardwalk. The house worked well for my family. The owner left gifts for our 3 kiddos as well as super attentive anytime I called. Great vacation for our entire crew ( in-laws too) and super grateful this family shared this piece of California joy with us. Sea Angel is the perfect place to get away from it all. We booked this for my moms 80th Birthday. The house was really clean and beautifully decorated. It was perfect for all 14 of us. Walking distance to the beach, boardwalk and restaurants. When we arrived the owner had some flower wait with a very nice card for my mom. Mom and all of us LOVED everything about this Sea Angel. We would recommend it to anyone. Seabright Beach also known as Castle Beach, is only 4 houses away, where the Harbor Light House is located. It is on the Banana Belt of Monterey Bay which has the warmest microclimate, & the widest sandy beach in Santa Cruz. Not only a Romantic & Luxurious Get Away, but a fabulous location where the sand is close enough to walk your beach toys to - whereby you can easily run back to the house if you forgot something. We have a Picnic Basket w/Tablecloths, Volleyball w/Net & 4 Badminton Rackets w/Birdies, Beach Umbrella, & 2 Beach Chairs for your use. 15 Minute WALK across the Railroad Tressle Walk Path to the FREE Friday Night Summer Concerts with Delightful Fun for the Kids on the Beach Boardwalk Amusement Park & adjacent Wharf. 2 Minute Walk to the Marina Loading Dock for a FREE Seasonal (Memorial Day-Labor Day) Weekend Water Taxi across the Harbor to Twin Lakes Beach & Harbor Fun! We provide a City Map & Santa Cruz Traveler's Guide to each Guest. Enjoy Wednesday night Sail Boat races, and even Dolphin watching right from the Ocean View Deck which seats 9.